Philadelphia Eagles wide receiver Alshon Jeffery celebrates after scoring a touchdown against the New York Giants during the first quarter at MetLife Stadium. You probably don't remember this, but before Thursday night, the Eagles were the second worst first-quarter offense in the NFL. Slow starts have been sort of the Eagles' thing this season, as they averaged 1.4 points per first quarter through five games. The Super Bowl champs appeared to be back in New York. 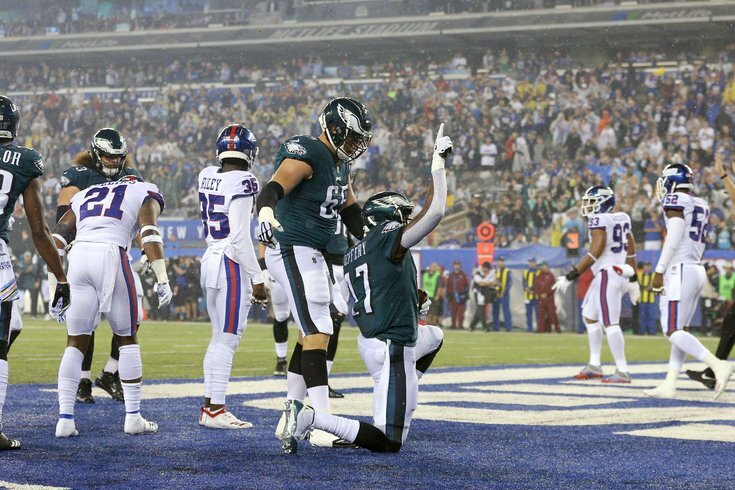 After a Kamu Grugier-Hill interception on a tipped Eli Manning Pass (by Jordan Hicks) and quick strike from Carson Wentz to Alshon Jeffery, that changed in Week 6 as the Eagles beat down their division rivals from New York 34-13. The first score was a gorgeous, classic Wentz scramble and throw. Two drives later, the Eagles upped their first quarter total to 14 points, as a sizable punt return from DeAndre Carter set up a march to a Corey Clement touchdown scamper. "We talk every week about how we want to start fast," Wentz said last Sunday after the Eagles gained a total of -4 yards in the first quarter against Minnesota. Their 14 first quarter points Thursday doubled their season total, and by halftime the Eagles led 24-6 (after a four-play 75 yard scoring drive toward the end of the second before a quick field goal). Last year in their march to their first Super Bowl title, the Eagles were third in the NFL in first half scoring (14.7) and second in first quarter scoring (6.4). Philly has played from behind in every game this season except one — their win Thursday. It's a nice change of pace that allows Doug Pederson to do a lot more on offense and takes pressure off the defense. The quick start also came defensively, as the Birds were able to have portions of four possessions with the ball in the first quarter while holding the Giants to two punts, an interception and also forced a fumble. It would be hard to argue that the momentum created early spurred the Eagles to victory, evening their record at 3-3 as a mini bye week approaches in nine days. The Panthers come to town on October 21 at 1 p.m.